Master Sheng Lyun was born in 1959 in Taiwan and graduated in administration from the national university. He became Master of Zen Buddhism and in the early eighties started to build his religious community, which in Taiwan alone has about 350.00 members. Quite a number of “followers” of the Master are spread over the world. Master Sheng Lyun founded his first Fo Fa Shan Sheng temple in 1984. Three years later he set up the foundation with the same name. His spiritual leadership is very much built around a Zen approach to tea (growing, brewing, preparing and drinking). Master Sheng Lyun is deeply rooted in farming and rural communities, where he tries to spend as much time as possible. His passion is (organic) tea growing, but also the countryside, the people living there and social causes. 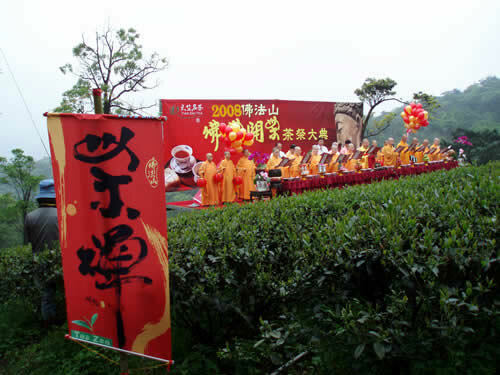 For nine years he has been chairman of the Chinese Organic Agriculture Association and for three years has headed the Chinese Zen Tea Association. He is recognized and popular in Taiwanese public life, which is also reflected by the fact that he became chairman of the (conventional) National Taiwanese Tea Association. Master Sheng Lyun has many interests, talents and skills. He is not only a Buddhist spiritual leader, but also a farmer, nature conservationist, successful businessman, expert in Chinese traditional medicine, poet and painter. A reflection on the work of Master Sheng Lyun and the Fo Fa Shan Organic Ecological Group Fo Fa Shan is a religious community, which has a significant dedication to the promotion of organic agriculture, ecology and environment conservation as well as cultural education, charity and public welfare. The organic agriculture activities started in 1995. On about 20 hectares throughout Taiwan Fo Fa Shan today grows organic tea, vegetables and other food for their monasteries and guests. Beside six Buddhist temples throughout Taiwan, which offer regular lectures on physical, mental and environmental protection, the group runs four organic and educational farms, a publishing house and the Sheng Charity Chinese Medicine Hospital, which offers free medical service to the disadvantaged and aged population in Taizhung. The hospital has treated hundreds of thousands of people over the years and has a high reputation for its successful practice of traditional Chinese medicine. The foundation is active throughout the country as well as internationally to educate on organic life beyond tea. Aside from spiritual literature, they publish a lot of brochures and books on organic agriculture and related topics. The Sheng De Magazine has a circulation of 200.000 copies. Alongside the 100 monks and nuns there is a staff of about 50 people, who always can rely on the help of an average of 200 fulltime volunteer workers and 100 organic promotion volunteers.